Custom coin displays and presentation options are much like your mobile phone’s protective case, they both accentuate and protect your purchase. The presentation options that are available are plastic capsules and velveteen boxes. These two presentation options can be used in conjunction with each other or separately. Velveteen boxes are available in blue, red or black and some offer either a vertical or horizontal indention inside to more safely display your custom coin. Plastic capsules can snap together or screw together and some may come with a foam ring insert for larger coins for added support and insulation. 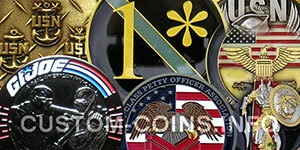 Coin displays come in a variety of shapes, sizes and layouts. These displays are typically for larger coin collections but you may even find one to suit a moderately sized collection. You never know unless you look.